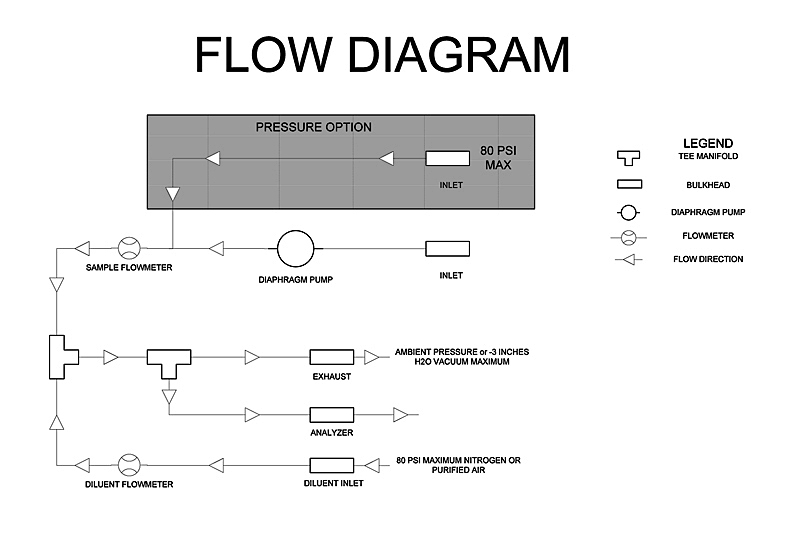 The Dilution System [flow diagram] operates by mixing the sample to be analyzed (the analyte) with diluent purified air or nitrogen. The optimal flow rates for both the analyte and diluent are determined based on the particular application, and are monitored and controlled at integral rotameters. The diluent is generally introduced from a nitrogen or purified air cylinder, but may also be obtained from suitably purified ambient air, under controlled pressure. The analyte is drawn into the dilution system by an integral diaphragm pump, and mixes with the diluent in a tee manifold. The diluted gas sample is then directed to the analyzer, with the excess being exhausted to atmosphere. Calibration data is provided for both rotameters, as is the initial factory-set dilution ratio for the unit.